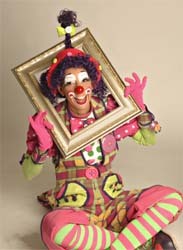 Lovely Buttons is an energetic clown who blends fun and laughter into whatever she does. She has been clowning since 1992 in sunny Arizona. She is a clown for all occasions! She is a third generation clown that began with her grandfather clowning in the small town of Douglas in the 40's and 50's. Her skills include Stilt walking, facepainting, balloons, walk-a-round, shows, and more! She is kept VERY busy being an officer for the World Clown Association. She is now the current Vice President for the World Clown Association. That means she is in charge of the upcoming conventions. The 2007 convention will be held in Alaska. Burr....... Princess Stephanie has invited the WCA to come to Monte Carlo for 2008. Julie was the first ever Alley Director for WCA for 5 years. That means she was in charge of all the Alleys (clown clubs) that are affiliated with the World Clown. That's alot of Alleys! She is currently Secretary for the Luv Clowns of Arizona and has held all offices at one point or another. She has been with the Luv Clowns since she started clowing in 1992. Julie has won many awards in her clown career. In 2000 she was awarded the "Clown of the Year" award from her peers while attending one of the many clown schools. She has also won gold, silver, and bronze medals while competing at several of the World Clown Conventions in costuming , makeup, and skits and paradeability. While attending parades with some of the Luv Clowns many trophies have been won and are shared by all. From 1999 to 2002 she was in the Arizona Roster Artists with the Arizona Commission on the Arts. She is also a published author of "Entertainers Record Keeping System". A book dedicated to entertainers to help them keep track of jobs and daily spending. Julie is the first to admit that she has the BEST jobs in the world. She's funny, witty, adorable and very easy to get along with!